Hill had climbed 180 feet up into the tree high on a mountain on December 10, 1997, for what she thought would be a two- to three-week-long "tree-sit." The action was intended to stop Pacific Lumber, a division of the Maxxam Corporation, from the environmentally destructive process of clear-cutting the ancient redwood and the trees around it. The area immediately next to Luna had already been stripped and, because, as many believed, nothing was left to hold the soil to the mountain, a huge part of the hill had slid into the town of Stafford, wiping out many homes. Over the course of what turned into an historic civil action, Hill endured El Nino storms, helicopter harassment, a ten-day siege by company security guards, and the tremendous sorrow brought about by an old-growth forest's destruction. This story--written while she lived on a tiny platform eighteen stories off the ground--is one that only she can tell. Twenty-five-year-old Julia Butterfly Hill never planned to become what some have called her--the Rosa Parks of the environmental movement. Shenever expected to be honored as one of Good Housekeeping's "Most Admired Women of 1998" and George magazine's "20 Most Interesting Women in Politics," to be featured in People magazine's "25 Most Intriguing People of the Year" issue, or to receive hundreds of letters weekly from young people around the world. Indeed, when she first climbed into Luna, she had no way of knowing the harrowing weather conditions and the attacks on her and her cause. She had no idea of the loneliness she would face or that her feet wouldn't touch ground for more than two years. 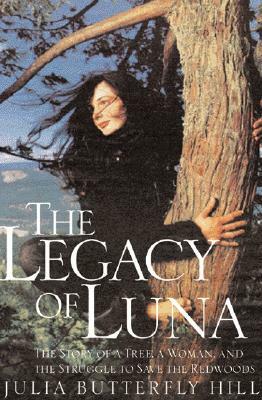 She couldn't predict the pain of being an eyewitness to the attempted destruction of one of the last ancient redwood forests in the world, nor could she anticipate the immeasurable strength she would gain or the life lessons she would learn from Luna. Although her brave vigil and indomitable spirit have made her a heroine in the eyes of many, Julia's story is a simple, heartening tale of love, conviction, and the profound courage she has summoned to fight for our earth's legacy.